Blockchain based XDC Wallet is a powerful tool--all thanks to its built-in smart contracts and peer to peer workflows. Today, we are continuously being occupied with more up-to-date and better digital wallets. However, when it comes to security and real-world usability of these digital wallets, most of them fail to prove its applicability in real world. Integrated over one-of-its-kind XDC protocol, XinFin’s Wallet product is not only a security compliance but has also found its usability across various industries. Be it Banking or Power, Solar or Tourism, Aviation or any diverse application across trade and financing, XDC Wallet can be used by individuals, corporates and financial institutions to facilitate both internal and cross border real time settlement including trade, financing, business transactions, equity transaction settlement and remittances. Devised upon XinFin’s flagship hybrid blockchain network protocol, XDC Wallet puts on the map a number of features in terms of security and high throughput coupled with low transaction fee as compared to other financial transactionary mediums. XDC blockchain based wallet can be integrated into industrial arenas with extended operations as well as with standalone businesses. XinFin provides option to set up Wallet on Private blockchain with or without changing any current running system to leverage blockchain based use case. The growing concept of going cashless has brought digital cryptocurrency wallets to the forefront. Blockchain based XDC Wallet is no exception. It comes with the convenience where individuals and organizations can make payments through XDCE tokens at both brick-and-mortar establishments and online purchases. They can cash in on the loyalty points and rewards they get by performing token based transactions. XDC Wallet is the most feasible solution for all kinds of establishments and institutions including banks, organizations, multi chain restaurants, stores, travel, hotels and online purchases and any other transaction record trail needed for the audit. Blockchain based XDC Wallet is a powerful tool--all thanks to its built-in smart contracts and peer to peer workflows. Running on a strong FIAT regulatory compliant XinFin network, XDC Wallet will gladly accept all merchant integrations with absolute interoperability with distinct payment and settlement systems as per compliance. XDC Wallet will also support KYC, AML and other standard regulations and norms. Supporting end-to-end work flows and built-in smart contracts for lending, XDC Wallet emerges out to be a dominant and useful. XDC Wallet being ‘FIAT compliance’ ‘multisig’ and ‘multicurrency’ Wallet becomes a convincing tool for licensed enterprises, banks and financial institutions. For banks who are in constant lookout of digital banking tools can get XDC Wallet integrated with all kinds of banking product. A complete banking tool in itself, this blockchain based Wallet can interoperate with other banking tools as well. As an integrated payments and settlement platform, XDC Wallet will enable merchants to receive settlements in FIAT currencies. XDC Wallet avoids the situation where unwanted crypto volatility is forced onto their balance sheet as they receive their payments in national currencies instead of cryptocurrencies. Merchants and financial institutions often suffer from the issue of liquidity and this is where XinFin's XDC Wallet comes to rescue. The FIAT compliance along with ‘multicurrency’ trait makes it a boon for parties involved in cross border payments and settlements. Also, ‘multi-party’ approval ensures transparency and security of funds. XinFin’s multi-currency XDC Wallet is compatible with all major cryptocurrencies and also enables you to maintain a FIAT currency balance. Designed exclusively for real world requirements, XDC blockchain wallet manages all the cryptocurrencies without any need for installing different apps and wallets for every digital currency. Integrated over Hybrid Blockchain technology, XDC Wallet gives its users full control over their cryptocurrencies as all their funds will be maintained on a secure and trustless platform with increased speed and scalability than a regular decentralized exchange. Apart from being multicurrency, XDC Wallet comes with FIAT currency integration—an element that allows exchange of XDCE tokens with any local FIAT currency or digital currency. So, if you are standing in cafeteria or a hotel and trying to settle bills over the counter in some foreign country, you can easily make payments in local FIAT currency. Businesses and individuals can even use XinFin’s blockchain wallet for cross platform and cross token payments. 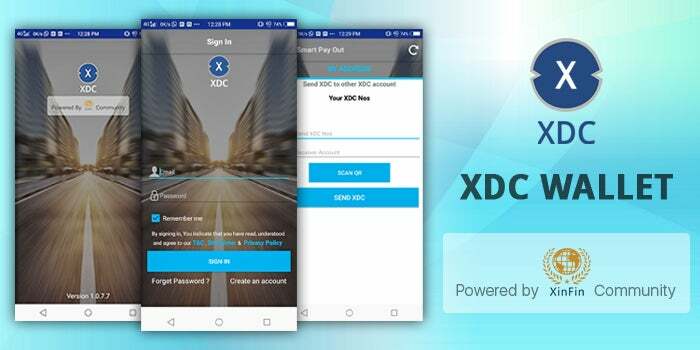 XDC Wallet is a multisignature (multisig) Wallet and therefore, holds huge potential, trustless margin, trustless escrow, and strong security for businesses, customers, individuals and anyone who wants to hold cryptocurrencies. Blockchain based XDC Wallet comes as a substitute to single-key addresses and comes with some immediate benefits. XDC wallet knocks out single points of breakdown by ensuring that the keys related to an address are generated and saved on fully separate devices, thereby ensuring security. In the process, redundancy is also achieved through multisig XDC wallet. Multi-sig feature of XDC Wallet can robustly benefit individuals as well as organizations in enhancing security, building access controls and allowing the delegation of partial trust. It goes without saying; XDC Wallet can be utilized with any compliance system supported by local law or with any running ERP or SAP by simply accessing secure Wallet API. “Sunlight received by earth in one hour is enough to meet the annual energy needs of all people worldwide.” Having realizing this fact, XinFin thought of financing a solar plant using Hybrid Blockchain Platform. XinFin successfully deployed blockchain technology for trade and finance using its TradeFinex platform. The successful demonstration of the use case involved integration of XDC Wallet on XinFin’s proprietary Hybrid Blockchain Technology. Digitization and IoT integration of XDC Wallet triggers peer to peer wallet transfer between multiple parties towards payment and repayment.